Essex /ˈɛsᵻks/ is a county in England immediately north-east of London. It borders the counties of Suffolk and Cambridgeshire to the north, Hertfordshire to the west, Kent across the estuary of the River Thames to the south and London to the south-west. The county town is Chelmsford, which is the only city in the county. 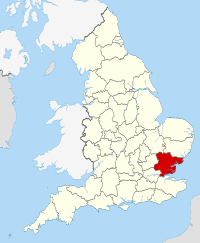 The name Essex originates in the Anglo-Saxon period of the Early Middle Ages and has its root in the Anglo-Saxon i.e. Old English name Ēastseaxe (i.e. the "East Saxons"), the eastern kingdom of the Saxons who had come from the continent and settled in Britain (cf. 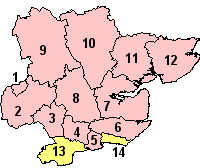 Middlesex, Sussex and Wessex) during the Heptarchy. Originally recorded in AD 527, Essex occupied territory to the north of the River Thames, incorporating all of what later became Middlesex (which probably included Surrey) and most of what later became Hertfordshire. Its territory was later restricted to lands east of the River Lea. Colchester in the northeast of the county is Britain's oldest recorded town, dating back to before the Roman conquest, when it was known as Camulodunum and was sufficiently well-developed to have its own mint. In AD 824, following the Battle of Ellandun, the kingdoms of the East Saxons, the South Saxons and the Jutes of Kent were absorbed into the kingdom of the West Saxons, uniting Saxland under King Alfred's grandfather Egberht. In changes before the Norman conquest the East Saxons were subsumed into the Kingdom of England and, following the Norman conquest, Essex became a county. During the medieval period, much of the area was designated a Royal forest, including the entire county in a period to 1204, when the area "north of the Stanetreet" was disafforested. Gradually, the areas subject to forest law diminished, but at various times included the forests of Becontree, Chelmsford, Epping, Hatfield, Ongar and Waltham. Essex County Council was formed in 1889. 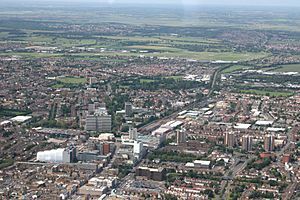 However County Boroughs of West Ham (1889–1965), Southend-on-Sea (1914–1974) and East Ham (1915–1965) formed part of the county but were unitary authorities (not under county council control). 12 boroughs and districts provide more localised services such as rubbish and recycling collections, leisure and planning, as shown in the map on the right. A few Essex parishes have been transferred to other counties. Before 1889, small areas were transferred to Hertfordshire near Bishops Stortford and Sawbridgeworth. At the time of the main changes around the turn of the 19th/20th centuries; parts of Helions Bumpstead, Sturmer, Kedington and Ballingdon-with-Brundon were transferred to Suffolk and Great Chishill, Little Chishill and Heydon were transferred to Cambridgeshire. Later, part of Hadstock, part of Ashton and part of Chrishall were transferred to Cambridgeshire and part of Great Horkesley went to Suffolk and several other small parcels of land were transferred to all those counties. The boundary with Greater London was established in 1965 when East Ham and West Ham county boroughs and the Barking, Chingford, Dagenham, Hornchurch, Ilford, Leyton, Romford, Walthamstow and Wanstead and Woodford districts were transferred to form the London boroughs of Barking and Dagenham, Havering, Newham, Redbridge and Waltham Forest. Essex became part of the East of England Government Office Region in 1994 and was statistically counted as part of that region from 1999, having previously been part of the South East England region. In 1998 the boroughs of Southend-on-Sea and Thurrock were granted autonomy from the administrative county of Essex after successful requests to become unitary authorities (numbered 13 and 14 on the map to the right). Essex Police covers the administrative county and the two unitary authorities. The county council chamber and main headquarters is at the County Hall in Chelmsford. Before 1938 the council regularly met in London near Moorgate, which with significant parts closer to that point and the dominance of railways had been more convenient than any place in the county. It currently has 75 elected councillors. Before 1965, the number of councillors reached over 100. The County Hall, made a listed building in 2007, dates largely from the mid-1930s and is decorated with fine artworks of that period, mostly the gift of the family who owned the textile firm Courtaulds. The pattern of settlement in the county is diverse. The Metropolitan Green Belt has effectively prevented the further sprawl of London into the county, although it contains the new towns of Basildon and Harlow, originally developed to resettle Londoners following the destruction of London housing in World War II, since which significantly developed and expanded. Epping Forest also acts as a protected barrier to the further spread of London. Because of its proximity to London and the economic magnetism which that city exerts, many of Essex's settlements, particularly those on or within short driving distance of railway stations, function as dormitory towns or villages where London workers raise their families. Part of the southeast of the county, already containing the major population centres of Basildon, Southend and Thurrock, is within the Thames Gateway and designated for further development. Parts of the southwest of the county such as Buckhurst Hill and Chigwell are contiguous with Greater London neighbourhoods and so for some purposes these are included in the statistical unit the Greater London Urban Area. 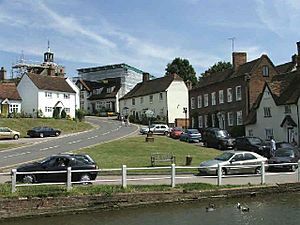 A small part of the southwest of the county (Sewardstone), is the only settlement outside Greater London to be covered by a postcode district of the London post town (E4). 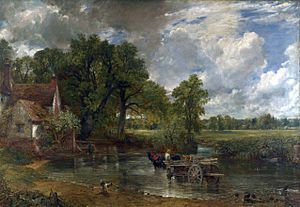 To the north of the green belt, with the exception of major towns such as Colchester and Chelmsford, the county is rural, with many small towns, villages and hamlets largely built in the traditional materials of timber and brick, with clay tile or thatched roofs. This region tends to have more similarities with East Anglia than the southern and western parts of the county. The main airport in Essex is London Stansted Airport, serving destinations in Europe, North Africa and Asia. The Conservative-Liberal Democrat coalition government formed in May 2010 agreed not to allow a further runway until a set time period, so curtailing the operator's ambitions for expansion. London Southend Airport, once one of Britain's busiest airports, opened a new runway extension, terminal building and railway station in March 2012. The station is on the Shenfield to Southend Line, with a direct link to the capital. Southend Airport offers scheduled flights to Ireland, the Channel Islands and multiple destinations in Europe. Essex has several smaller airfields, some of which owe their origins to military bases built during World War I or World War II, giving pleasure flights or flying lessons; examples include Clacton Airfield, Earls Colne Airfield, and Stapleford Aerodrome. The Port of Tilbury is one of Britain's three major ports, while the port of Harwich links the county, with a passenger and freight service to the Hook of Holland and a freight service to Europoort. A service to Esbjerg, Denmark ceased in September 2014 and earlier a service to Cuxhaven, a port on the Elbe estuary in Germany, was discontinued in December 2005. The UK's largest container terminal London Gateway at Shell Haven in Thurrock partly opened in November 2013, Final completion date is yet to be confirmed. The port was opposed by the local authority and environmental and wildlife organisations. East of the Dartford Road Crossing to Dartford, Kent, across the Thames Estuary a ferry for pedestrians to Gravesend, Kent operates from Tilbury during limited daily hours, and ferries for pedestrians operate across some of Essex's rivers and estuaries during spring and summer. The M25 and M11 motorway both cross the county in the extreme south and west, enabling regular commuting to/from parts of the county with Kent, Hertfordshire and Cambridge. The A127 and A13 trunk roads are important radial routes connecting London and the M25 to the south of Essex. The A12 runs across the county from the south west to the north east and carries traffic not just within Essex but also between London and Suffolk, east Norfolk and the ports of Felixstowe and Harwich. Rail goods have several ports and dedicated lines. The county's coat of arms comprises three Saxon seax knives (although looking rather more like scimitars) arranged on a red background (Gules three Seaxes fessewise in pale Argent pomels and hilts Or points to the sinister and cutting edges upwards); the three-seax device is also used as the official logo of Essex County Council having been granted as such in 1932. The emblem was attributed to Anglo-Saxon Essex in Early Modern historiography. The earliest reference the arms of the East Saxon kings was by Richard Verstegan, the author of A Restitution of Decayed Intelligence (Antwerp, 1605), claiming that "Erkenwyne king of the East-Saxons did beare for his armes, three [seaxes] argent, in a field gules". There is no earlier evidence substantiating Verstegan's claim, which is an anachronism for the Anglo-Saxon period seeing that heraldry only evolved in the 12th century, well after the Norman conquest. John Speed in his Historie of Great Britaine (1611) follows Verstegan in his descriptions of the arms of Erkenwyne, but he qualifies the statement by adding "as some or our heralds have emblazed". Essex is also home to the Dunmow Flitch Trials, a traditional ceremony that takes place every four years and consists of a test of a married couple's devotion to one another. A common claim of the origin of the Dunmow Flitch dates back to 1104 and the Augustinian priory of Little Dunmow, founded by Lady Juga Baynard. Lord of the Manor Reginald Fitzwalter and his wife dressed themselves as humble folk and begged blessing of the Prior a year and a day after marriage. The prior, impressed by their devotion bestowed upon them a flitch of bacon. Upon revealing his true identity, Fitzwalter gave his land to the priory on the condition a flitch should be awarded to any couple who could claim they were similarly devoted. By the 14th century, the Dunmow Flitch Trials appear to have achieved a significant reputation outside the local area. The author William Langland, who lived on the Welsh borders, mentions it in his 1362 book The Vision of Piers Plowman in a manner that implies general knowledge of the custom among his readers. Essex has become associated with the derogatory stereotype, 'Essex girl' and the political stereotype 'Essex man'. The association has been amplified in popular culture through the reality television series 'TOWIE' (The Only Way Is Essex), which has attracted criticism for its stereotyping. The Essex dialect, an accent related to the Suffolk dialect, was formerly prevalent in the county but is now mostly replaced by Estuary English. Essex Facts for Kids. Kiddle Encyclopedia.